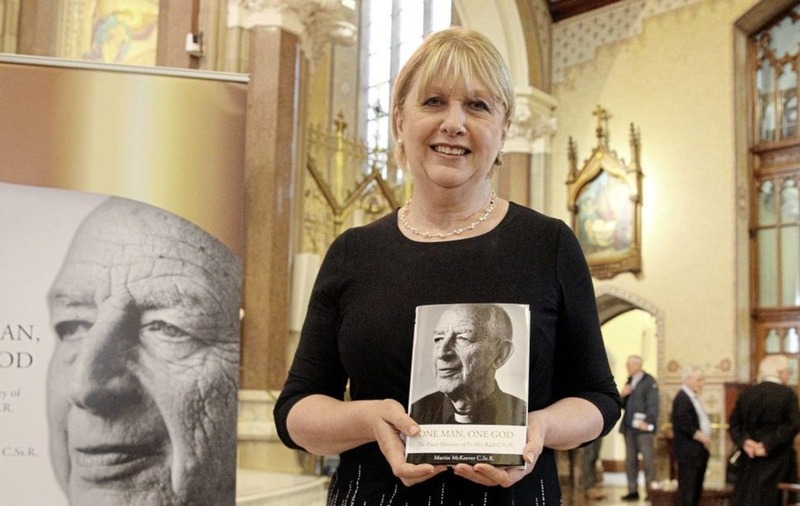 FORMER President Mary McAleese visited Clonard Monastery in west Belfast last night to help launch a new book on the late Fr Alec Reid. Written by Redemptorist professor of moral theology in Rome, Fr Martin McKeever, ‘One Man One God: The Peace Ministry of Fr Alec Reid’ examines the cleric’s work. The Co Tipperary-born Redemptorist priest, who died in 2013, was widely viewed as one of the architects of the peace process. During his 40-year ministry from Clonard Monastery, Fr Reid secretly acted as a conduit between the republican movement and the SDLP during efforts to bring about an IRA ceasefire. The cleric also worked behind the scenes to try to persuade the IRA to provide more information on where the bodies of the Disappeared were buried and was one of the witnesses who confirmed the decommissioning of IRA weapons. Speaking before last night’s launch, Mrs McAleese, who was born in Ardoyne, north Belfast, said Fr Reid was a key figure in the peace process. “No-one will ever know the fullness of Fr Alec’s contribution to the peace and good neighbourliness we now enjoy but ‘One Man, One God’ lets us know something of what we owe him,” she said. ‘One Man, One God: The Peace Ministry of Fr Alec Reid’ is published by Redemptorist Communications in Dublin.